Lead is a naturally occurring transition metal and a common trace element in many soils, including those derived from both bedrock and unconsolidated geologic materials. Natural background sources of lead in soil are predominantly associated with parent materials containing feldspar minerals (Reimann et al. 2011). Background levels of Pb in soil are highly variable and depend greatly on the parent material. As soils undergo weathering and primary mineral dissolution, with rates and extents primarily dependent on climatic factors and soil pH (White and Brantley 1995), lead becomes sequestered within the soil matrix through various reactions with soil organic matter (Strawn and Sparks 2000), secondary aluminosilicate clay minerals (Saha, Taniguchi, and Sakarai 2001), or reactive solid-phase oxides of iron and manganese (McKenzie 1980). A recent U.S. Geological Survey (USGS) study of background soil lead concentrations in the conterminous United States reports the median and 95th percentile in the 0- to 5-centimeter depth as 18.1 mg/kg and 44.5 mg/kg, respectively (USGS 2014); the study results are shown in Figure 6-1. Figure 6‑1. Lead distribution in surface soil of the conterminous United States. 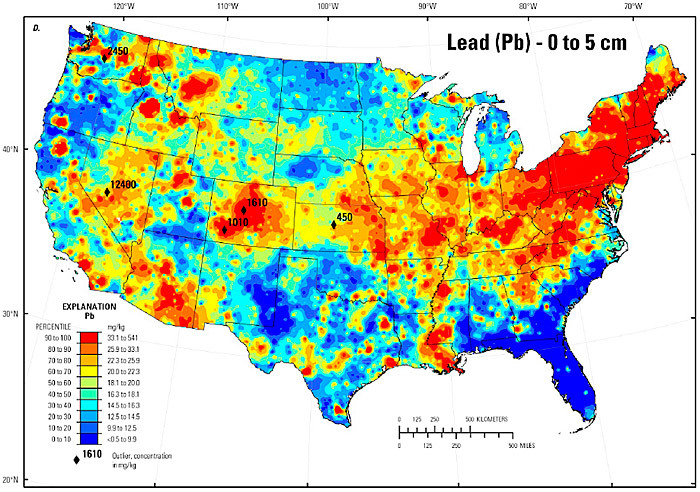 Historical leaded gasoline, lead-based paint, and mineral ore mining activities are the primary anthropogenic sources of lead contamination in the United States. Lead-based paint constitutes the primary point source of concern because of its widespread use prior to 1978. Outside of heavily industrialized areas and municipalities affected by historical mining activities, lead-based paint exposure is currently considered to be the primary source of elevated blood lead levels (BLLs) in children (Jacobs et al. 2002). In addition to possible lead exposures inside the home due to deteriorating paint, exterior lead is transferred to surrounding soils through scraping and sanding of painted surfaces, uncontained debris, and normal weathering processes. USEPA estimates that 69% of homes built between 1940 and 1959 and 87% built prior to 1940 were painted with lead-based paint (USEPA 2016c). Lead contamination is ubiquitous in urban areas, but also commonly found at elevated levels in rural areas – 8.4% of children in rural New York were found to have BLLs double the Centers for Disease Control and Prevention’s (CDC) current reference level (5 µg/dL), with 2.1% having levels three times the reference level (Schaffer et al. 1996; Hendryx, Fedorko, and Halverson 2010; Ossiander, Mueller, and VanEnwyk 2005; Norman et al. 1994; Hanchette 2008). Diffuse nonpoint sources of lead contamination in soils alongside roadways are often the result of leaded gasoline use (Lagerwerff and Specht 1970) and to a lesser extent lead-based wheel weights (Aucott and Caldarelli 2011). Nriagu (1990) estimated that seven million tons of lead were burned in the United States as a gasoline additive between 1926 and 1985. Incidental ingestion and inhalation of lead-contaminated soils from diffuse sources has clearly been shown to elevate BLLs in children (Laidlaw et al. 2005; Glorennec et al. 2010; Oulhote et al. 2011; Zahran et al. 2013). Diffuse sources of lead contamination contribute to cumulative risk along with nonsoil exposure routes (such as food intake or direct consumption of paint chips). Mine-impacted lands are among the largest (spatially) contaminated areas in the country. Whether lead is the primary metal of interest or a waste byproduct (for example, from gold or silver extraction), lead contained in waste rock, impoundments, and mine tailings, or particulate emissions from historical smelter facilities can harm nearby ecosystems. For example, at the Bunker Hill Superfund Site in Kellogg, Idaho, an estimated eight million tons of lead were mined, 61.9 million tons of tailings (including 880,000 tons of lead) were discharged into the Coeur d’Alene River, and substantial but unquantified amounts of lead were released into the atmosphere from historical smelter emissions (USEPA 2001). Sites like Bunker Hill exist throughout the United States. Acid mine drainage from abandoned mines also contributes to lead contamination of waterways. For example, the Yak Tunnel, an abandoned mine drain in Colorado, resulted in an estimated discharge of 210 tons of metals per year (including lead) into the California Gulch prior to mitigation measures (USEPA 1994a). While the industrial and consumer uses of lead have declined substantially over the last few decades, landfill wastes (such as batteries and plumbing materials) and former firing ranges are contemporary sources that can contaminate the environment. Operational small arms firing ranges (SAFRs) are another significant contemporary source of anthropogenic lead contamination. There are thousands of active outdoor SAFRs in the United States, including an estimated 9,000 nonmilitary ranges and more than 3,000 SAFRs operated by the U.S. Department of Defense (ITRC 2003). Lead and other metals associated with projectiles are of potential concern at these outdoor ranges. The projectile metal composition varies based on type and manufacture, but on average consist of over 90% lead, 1–7% antimony, <2% arsenic, and <0.5% nickel (Sneddon et al. 2009). Metallic fragments can contaminate range soil as the result of dissolution. Rates of dissolution, however, are highly variable and depend on site-specific climate and soil factors (Li et al. 2015), and estimates suggest centuries are required for complete disappearance of the metallic debris at closed ranges (Jørgensen and Willems 1987).